VIETNAM, June 2014 – It all comes down to people. Recognizing the importance of staying up to date with industry best practices, WaterSHED’s senior team in Vietnam developed a ‘Sales Mastery’ training course in partnership with Mr. Aun Hengly, WaterSHED Executive Director. The goal is to adapt world-class training concepts into real-world exercises that are relevant in the rural context of southern Vietnam, and to make cutting-edge sales theory available for practical application by WaterSHED’s Mekong Delta region staff and partners. In order to build up the ideal attitude and work practice within the sales force, the HappyTap senior team developed an arsenal of tools and techniques embodied in the ‘Sales Mastery’ program. 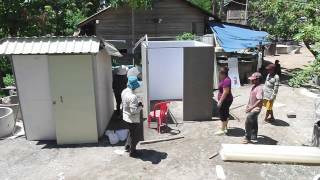 This process benefits from significant learning exchange with Cambodia, where WaterSHED’s successful Hands-Off Sanitation Marketing program has enabled a dramatic increase in the purchase of latrines by rural households. It creates clear guidance and inspiration about human motivation, changing attitudes and sales techniques – especially the powerful 6 steps sales process, which Hengly calls “the password to a successful sales event”. strengthen trainers’ ability to connect with the wider staff. 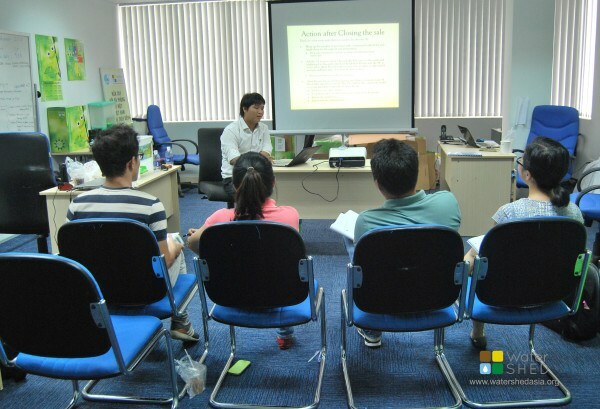 It builds their confidence to lead and develop the Vietnamese staffs in the field. WaterSHED Vietnam has developed a marketing strategy to push sales of a handwashing device, the HappyTap, while simultaneously fostering the growth of the supply chain for ongoing sustainability. The device is a pioneering concept in handwashing designed for aesthetic appeal and affordability. The marketing program is supported with the generous assistance of USAID.